Good To Go Video Slot Review - Casino Answers! 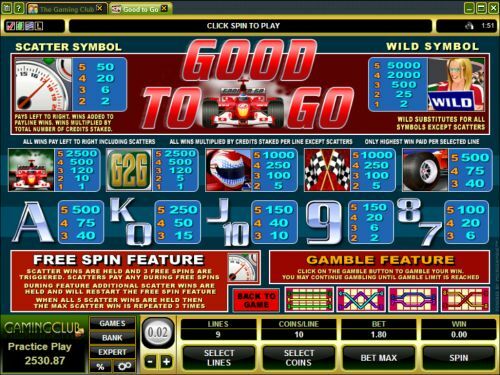 Good to Go is a 5-reel, 9-line video slot developed by Microgaming, featuring a wild symbol, scatter wins, a free spins feature and a gamble feature. You can play the Good to Go video slot at Bovada. Coin values on the Good to Good slot machine are $0.01, $0.02, $0.05, $0.10, $0.20, $0.25, $0.50 and $1. You can select up to 9 paylines per spin at up to 10 coins per line. The lowest total bet you can make is a penny on the Good to Go penny slot up to the highest total bet possible of $90 per spin. The Good to Go slot game has a very good betting range that should suit any online slots player. To play the Good to Go video slot, select your bet and press the “Spin” button. You can alternatively press “Bet Max” to play all 9 lines at 10 coins per payline. The Pit Girl is the highest paying symbol on the Good to Go casino game. If 5 Pit Girl symbols appear on an active payline, you will win the 5000 coin top jackpot. The Pit Girl symbol is wild and will substitute for all symbols except for scatter symbols. Other high paying symbols include the Racecar (2500 coins), License Plate (2500 coins), Helmet (1000 coins) and Checkered Flag (1000 coins) symbols. The scatter symbol on the Good to Go online slot is the Speedometer symbol. You can receive a scatter win by landing two or more Scattered Speedometer symbols from left to right. You can win up to 50X in scatter wins by landing all 5 Speedometer scatter symbols on the reels. Whenever you receive a scatter win, you will win 3 free spins and all reels with a scatter symbol on them will be held. Scatter wins pay anywhere during the free spins feature, rather than only from left to right. During the free spins feature, additional scatter wins are held and will re-trigger the free spins feature. If all 5 scatter wins are held, then the maximum scatter win of 50X will repeat three times. You will be Good to Go once you trigger this feature when you play at Bovada! Whenever you get a win on the Good to Go slot game, you can press the “Gamble” button to activate its gamble feature. Predict whether the facedown card will be red or black to double your win. If you are wrong, you will lose your winnings. Press the “Collect” button to exit the Good to Go gamble feature and bank your winnings. To use the autoplay mode on the Good to Go online slot machine, you must hit the “Expert” button. You can now play 5 or 10 autoplay spins. For advanced settings, hit the “AutoPlay” button and you can now play 5, 10, 25, 50, 100, 250 or 500 autoplay spins and stop autoplay if a win exceeds or equals $100, $500, $1000, $5000 or $9999. Autoplay will stop on any feature contained in the game. You can stop autoplay at any time on the Good to Go slot game. Good to Go is an average Microgaming video slot. 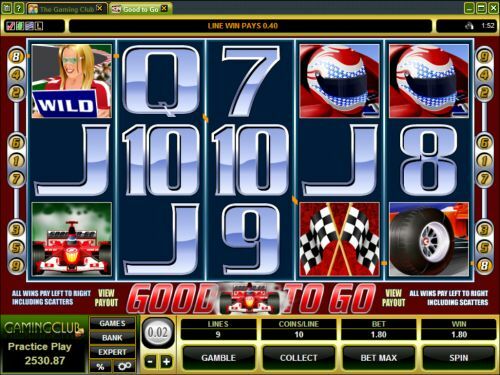 It doesn’t have the best presentation or the best special features, but if you’re playing at a Microgaming online casino and you want to play a car racing video slot, it doesn’t hurt to give the Good to Go video slot a few laps. Play the Good to Go slot game when you sign up and make a deposit at Bovada. Can players from the USA play the Good to Go online slot game for real money? No, American players cannot play Good to Go for real money at this time. For an alternative, we recommend you read our Green Light Video Slot Review or play it at Bovada. Where can I read more sports-themed online slot reviews? If you want to read some slot reviews with themes such as auto racing, soccer, football, baseball, horseracing, bowling, boxing, hockey or whatever sport you desire, please read our list of sports slots at online casinos. Is there a Good to Go free flash game being offered at instant play casinos? Yes, you can find the Good to Go flash game on page 8 at Microgaming flash casinos such as Bovada. You can play for free or real money. For the best possible performance, make sure you have the newest version of Adobe Flash Player.